Fine Adornment of American History. Impressive on any Home or Office Wall. 1855 Hand-Colored Map United States No. 5 Tennessee, Mississippi, Alabama, Georgia, & Florida. Map is in Good condition. Original Map Drawn & Engraved for the 1855 Edition of Cornell's Intermediate Geography: Forming Part Second of a Systematic Series of School Geographies; By S. Cornell, Corresponding Member of The American Geographical and Statistical Society; Drawn by J. Minton, Engraver; Published 1855 by D.
Appleton and Company: New York, 443 & 445 Broadway, 1855; a copy of the Title Page of which is included. A Fine Map for the Collector or makes an Imaginative and Creative Gift. View my Store for more Antique Maps and other Antiques. Thank you for your interest. Impressive On Any Home or Office Wall. Great for Genealogy & Family History, as Map shows Cities, Towns, & Landmarks of 1855, Some of which No Longer Exist Today. A Frame is Not Included. 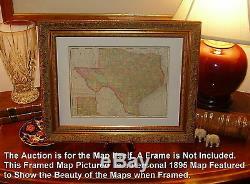 The framed map pictured is a personal map featured to show the beauty of the maps when framed. Maps are mailed next day and with most arrive within 2-3 days. Imaginative & Creative Birthday, Christmas, or Special Occasion Gift. Greetings from Historical Savannah, Georgia: Founded 1733. Some, to beautify their halls, parlors, chambers, and libraries... Loveth, getteth, and useth maps, charts, and geographical globes. John Dee, Advisor to Queen Elizabeth I. 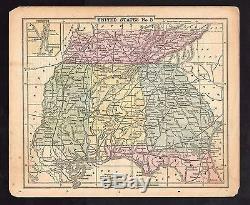 The item "Original 1855 Pre-Civil War Antique Map SOUTHERN STATES Alabama Georgia Florida" is in sale since Monday, December 25, 2017. This item is in the category "Antiques\Maps, Atlases & Globes\North America Maps". The seller is "jonesjackson" and is located in Savannah, Georgia.